Black roses are not actually grown, they are dyed to be that color. The darkest rose is actually a very dark crimson or red. Many florists do not carrying black roses, so you can make them yourself using this guide. Strip all of the leaves off of the roses. You may leave some or all of the leaves on, but be advised that the leaves will also absorb the color and can produce undesirable results. Set aside. Using the vase, fill with very warm water. Add the flower dye and preservative. This should be prepared before the next step to ensure accuracy. Cut several inches off of each stem underwater to prepare for dipping. Mix the instant hydration pretreatment solution per directions and dip each flower stem end in the solution. Immediately place the roses into the dye solution. Wait until desired color is obtained. 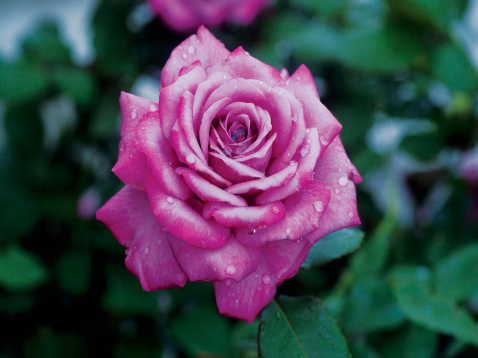 If you plan to press the roses, keep in mind the flower will press darker than the color it is dyed to. What Does the Blue Rose Represent?